Becky from Squirly Girl Creations is having a super fun challenge. I made a little notepad using just my scrap paper and my K. Andrew Designs "Positive Thoughts" Art Stamps. I started out with a scrap Z-fold card (you can make 2 out of a 8 1/2 x 11 sheet of paper so I had 1 left over in my stash) and I added some scrap printer paper. Using my Your Story (for the first time) I bound it all. I made the rocket with the Nifty Fifties cartridge (using my scrap stash) and added some pearl pen, glitter pen, stickles, fabric scrap from my new Expression cover and presto chango I have a little notepad. So now I know everyone has scraps and don't try telling me different. :-) I also know a lot of you have K. Andrew Designs stamps because we can't resist them. Head over to Squirly Girl Creations and enter her challenge. I finally got a cover made for my Expression!! The pattern came from Custom Crops if anyone would like to make one. I can not believe it took so long for me to bite the bullet because it went together in about an hour. I kept putting it off for reasons unknown to me. lol Now I need to find a pattern for my Inspiration so I can have a matching set. If anyone knows where I can find one give me a holler. Can anyone see my very favorite thing in this picture?? It's hanging right there above my scissors. Yes Yes Yes it is my ring of K. Andrew Designs stamp sets. They hang right at my fingertips because I am always using them. Her stamps are so cool and she is releasing 3 more sets in August!!! While you are there getting some of these for your own fun please drop her a note telling her that OmaGloria sent you!! I am really liking Shaker Cards. 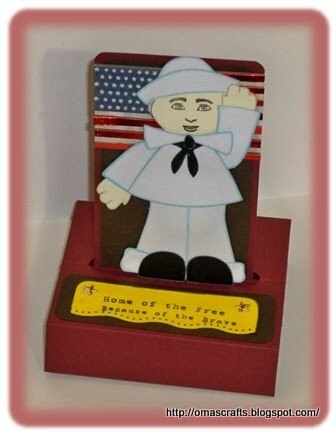 I used the hat from "Stand and Salute" for this card and filled it with Twinklets Diamond Dust. The sentiment is from K. Andrew Designs "Freedom Isn't Free" stamp set. This set benefits Intrepid Fallen Heroes Fund. Getting Cricky for the Simply Sunday Freedom Isn't Free challenge. Crafty Sprouts Shaker Card Challenge. This is my very first shaker card and it was so much fun. I think it turned out pretty cool. I am entering it in the Sweet Treats - Ice Cream Cone challenge at Bitten by the Bug 2 and the Shaker Card challenge at Crafty Sprouts. The Ice Cream Cone is from Sweet Treats and the balloons are from Smiley Cards. I also added some twine from The Twinery. The sentiment is 2 different stamps from K Andrew Designs "Food for Thought" stamp set. The sale of this set benefits the Storefront Shelter. A donation of at least $1, from each stamp set sold, is made to charity. There is less than 2 weeks until she announces her new Design Team and I have been on the edge of my seat. I applied and would so love to join her Team. Every part of my body that will cross has been crossed. Her current Design Team has had so much fun the last 3 months and I have enjoyed seeing all the great projects they have made. Anyone would be honored to work with Kristal. This is my attempt at a lever card. I had a lot of trouble figuring out how it went together until... YouTube to the rescue. The cut file is from SVG Cuts and I could have sworn that they had videos on all their projects but I checked everywhere and it could not be found, but on YouTube there was another lever card so I could get the general idea. The sentiment is from K. Andrew Designs "Splash-tastic Summer" stamp set. Her stamps are so awesome and they also benefit charity. Splash-tastic Summer benefits Autism Research Institute. Amy from Love to Crop hijacked Getting Cricky yesterday with a most excellent post. I loved it so much I had to turn it into vinyl for my walls. This is a quote by Zig Ziglar that is now in my craft room so I can always remember to stay positive. When I googled him I found a few more quotes that I would like to turn into wall art also. This is a hymn by Annie Johnson Flint. It is so beautiful and has such a strong message. God has not promised us a life without pain and sorrow but he has promised that he will be there with us when we are going through it. It is on the wall right outside my craft room so that everyone that comes to my house can see it and just maybe they will find some comfort in it when they need it. This weeks Simply Sunday challenge is all about Food. This is such a cool challenge because I love sending little notes in my grandson's lunch and now I get to have a little head start. This year my granddaughter will be joining him and starting pre-school. They are going back to the Christian school. Bryce went there in pre-school but they were having problems with the safety of the school so he went to public school last year. The Christian school tore down 1/2 of their building (the oldest part) and got a grant to redo the rest and it is now it really good shape so Bryce will be going back for 1st grade and Kylie is joining him. They do not get lunches delivered so all the kids take sack lunches and this gives me a great opportunity to tuck a little note. Bryce really loved the notes I sent when he took his lunch last year so I'm sure he will be happy again this year. All the sentiments for my cards came from K. Andrew Designs "Food for Thought" stamp set. This is such a great set and so perfect for lunchbox cards. It also benefits the Storefront Shelter for Homeless Children so that is a doublely good thing. The faces for the eggs is from PK-530 Simple Simons Face Assortment and the die that is used for the cards is from Papertrey Ink. I ordered this die especially for sending notes in lunches but have used it for so many more things. All of the cut files for these cards are from My Scrap Chick. Please tell me I am not alone. Here in Nebraska we have what we call June bugs and they are yucky. I am terrified by these little buggers. They get tangled in my hair and buzz and the hard shell thuds against the windows. I am the only one in my family that is scared to death by them and when the sun goes down I want everything locked up. The 4th of July was a nightmare for me because the garage door was open, the lights were on and the June bugs were swarming. My daughter had the bug zapper and I told her that they all needed to be taken care of. I tell you the garage floor was covered the next morning. "July First of the Month Challenge - Doodlecharms"
over at Card Creations & More by C.
My 3 year old grand daughter is fearless!! She is my Super Hero. The bugs were cut from Doodlecharms. I also cut out the picture of the June bug she picked up and adhered it to the back of the big bug. The sentiment is from K. Andrew Designs "Amazing You" stamp set. I combined four different stamps from this set. I am also thinking about adding this bottle cap to the layout. It has the actual June bug and I covered it with Diamond Glaze. So let me know if you think I should add the bottle cap or leave it off. Maybe I can make Kylie a necklace out of it?? Tell me what you think. P.S. I want everyone to know the this June bug was found on our back porch. It was definately already deceased before I put it in the bottle cap. I wouldn't have come near it if it were still alive. Here is a video on how I used the 4 stamps to make 1 amazing sentiment. This card is in honor of my 3 little bear cubs. I am totally all about the bears. I used a cut file that I purchased from Digi Kitty (Kristal) a while ago. This file is also part of my blog banner and I absolutely LOVE it. The faces on the 2 bigger bears are from PK-493 & 494 "Everyday Character Face Parts and More" and the smallest bear face I drew in. The sentiment is 2 different stamps from K. Andrew Designs "Food for Thought" stamp set. I have now used at least one stamp, from each of her 6 fabulous sets, on a project. These stamps are the absolute best stamps. I love each set because you can do so much with them, they stamp so cleanly and best of all a donation, of at least $1, is made to a charity for every set sold. If you have not checked out her stamps you really need to head over to K. Andrew Designs now. I promise you will never regret it. I added some twine from The Twinery to complete this card. Cards Creations & More by C has started having 3 different challenges each month. She lists all 3 on the first of the month and then you have 3 weeks to enter. How cool is that?? One of this months challenges is to make a project that is inspired by another bloggy friend. Amy from Love To Crop made an adorable purse and I just had to have one. This purse is made from 2 12x12 pieces of cardstock and Amy has some awesome instructions on her blog. Head on over and have some fun. The sentiment is from K. Andrew Designs "Fashionable Friends" stamp set. I punched a small scalloped oval and then a big scalloped oval over top of the small one so it made a frame. I stamped the sentiment and then punched it out with the big oval and added the frame. I then filled the frame with glossy accents and added some little gemstones. Now all I have to do is fill it with photos. Kristal, from Getting Cricky, and her Design Team are having a Blog Hop this Friday, July 15th through Sunday, July 17th and everyone is invited to attend. The hop is in support of our fallen Heroes. Each Design Team member will be featuring cards of thanks that will then be delivered during the "Run for the Fallen" in Maine. "Run for the Fallen Maine is an organization dedicated to keeping alive the memory of our military heroes that gave their lives to protect our freedom since September 11, 2001. On Sunday August 21, 2011 the 4th run to honor our heroes will be held. This is a 65 kilometer event with each kilometer being dedicated to the memory of one of our heroes that lived in Maine, had family from Maine or had some ties to our home State." Rebecca from Crafting Misfit will be the one delivering the cards during the event. We all have a chance to support this amazing cause also. The details will be revealed Friday. Donations can also be made directly to the organization HERE. This is such an amazing cause and I consider it an honor to be able to participate, in any way, in honoring those that have given us so very much. I have embroidered memorials for the families of fallen heroes and wish that I could do more. Here is one more opportunity to show how much we can honor our soldiers for their service. Amy from Love to Crop is also having a giveaway for one hop participant so head over to her blog to check things out. This week's Simply Sunday Challenge at Getting Cricky is all about fashion. I am seriously "Challenged" when it comes to fashion so hey this is right up my alley. My $$ get spent on craftys before wardrobe. I live in shorts and tank tops in the summer and sweats and t-shirts in the winter. The sentiment for this Peek-A-Boo card is from K. Andrew Designs "Fashionable Friends" stamp set. It is actually one stamp and I covered half of it with tape and stamped the sentiment that shows when the card is closed and then covered the other half and stamped the sentiment that shows when the card is opened. I used the "Happily Ever After" cart for the cuts on this card. Petal Pink liquid pearls and glossy accents were added to the shoe to make it look a little like a glass slipper and some pearls to the inside to finish it off. This free standing pop-up card is for my sister-in-law. My nephew is in the Navy and stationed in Japan so my husband's sister misses him and I thought this would be the perfect card for her. You can check out the tutorial for this card at Splitcoast Stampers. The flag is from K&Company Americana Layered Accents. The cut file is "Sailor" from My Scrap Chick. His cute little face is, of course, from Peachy Keen Stamps "Groom Faces"
The sentiment is from K. Andrew Designs "Freedom Isn't Free" stamp set. I am having so much fun with her new stamps. I ordered all 6 sets and have used 5 of them so far. Only 1 more to go but that will not be the end because they are so fabulous and versatile that I will never run out of opportunities to use them. The finishing touch to this card is the 2 stars on the sentiment that I i-rocked on and it just added the pop that finished off the card. Thank you Erika, from Cricut Love, for your Wiper Card tutorial. I used the "Island2Visit" stamp set from The Stamps of Life for the graphics on this card. The sentiments are from K. Andrew Designs. "Simply" and "Lazy Days" are from Splash-tastic Summer. "So Sweet" is from Amazing You. "Attitude is Everything" is from Positive Thoughts. I am so loving these stamp sets!!! They are so easy to use, they stamp awesomely and they benefit charity. How could anyone ask for anything more. I used Pearl Pens and Stickles for the finishing touches. I am so very excited and want to give a HUGE thank you to Kristal from Getting Cricky for the opportunity to be a featured blogger on her blog Getting Cricky with K. Andrew. Her blog is the first one that I started following when I started my blog almost a year ago. She is such a kind and generous lady. Her posts are so very inspirational. She is one of the most real and genuine people I have met online. I am so honored that she has given me this opportunity. Onto my Little Purse Booklet tutorial. I used the Sizzix Bigz Die “Booklet, Purse & Pages” with my Cuttlebug and the 6” x 13” B cutting plates. The paper is from DCWV “Once Upon A Time” stack. The cutting plates are not quite long enough for this die so I make 2 separate runs through the Cuttlebug. One for the purse and one for the pages. I cut 2 purses at once. And 4 pages at once. I used my Crop-A-Dile to punch 2 holes in the bottom through the 2 pages and the purse and then insert something like an eyelet but it is close on one end. (not sure what they are called). I used 4 very tiny flat magnets (Lynn asked where I got the magnets so here is the link.K&J Magnetics) and adhered them to the purse flap with Tombo Mono Multi liquid glue. OK I have to say it. I do love my Tombo but I have got to get some more Scotch Quick Dry. The Tombo is great but I miss having the flat cap so I can keep the bottle upside down. The Scotch also has a smaller tip so it comes out slower than the Tombo. Gotta get to the store soon. The clothespin helps to keep the flap closed while the glue dries. While waiting for the glue to dry punch 2 tags. I used the EK Success “Photo Labels” punch. The sentiment I used is from the “Fashionable Friends” stamp set by K. Andrew Designs Art Stamps. They are a very high quality stamp! Made in the USA and she also donates at least $1 from every stamp set to charity. So she helps support the American worker and good charities. If you are a stamp addict like me you have got to check her stamps out. I have a great bloggy friend Carri from “DoubleClickConnections” and I emailed her and asked if she could possibly send me a package of those wonderful things that everybody is making their Skittlez out of. (I of course would reimburse her) and she was so terrific to send me a huge bag of them. I had so much fun making these in every color of alcohol ink that I have. I was a real ding bat though and very excited about playing and I used my ink for re-inking my Distress Inks. I was crushed when they didn’t turn out and couldn’t figure out what I had done wrong. YouTube to the rescue and DUH. I knew I needed to use alcohol ink but in my haste wasn’t thinking. The Distress Ink does wipe off with a tissue so none were wasted. Thank you Carri!! I used dimensionals to adhere the tag to the outside of the purse and used another stamp from K. Andrews “Fashionable Friends” stamp set on the inside of the purse. The final touch is another Skittlez on the purse flap just to polish things off and Presto. Cute little purse booklets for all of your “Fashionable Friends”. To celebrate being featured on Kristal's blog I am giving away a Preserves Cricut cartridge. All you have to do is be a follower and leave a comment on this post. I am only able to mail within the U.S. I am sorry but funds right now do not allow much for postage. I hope you all enjoyed my little tutorial and Thank You again Kristal for having me as a featured blogger. I really enjoyed it and you are such a Fab-U-Lous friend.